This PDF 1.3 document has been generated by Word / Mac OS X 10.13.1 Quartz PDFContext, and has been sent on pdf-archive.com on 15/12/2017 at 17:27, from IP address 71.184.x.x. The current document download page has been viewed 112 times. File size: 317 KB (21 pages). practical life, sensorial, language, mathematics and cultural. appropriate educational and play experiences. families. Join	the	5,000+	area	moms	and	dads	who	never	miss	a	fun	family	event	and	subscribe	today! and provide a safe, nuturing environment that cultivates self-esteem. connections that children infer about the objects, actions, and people in the world around them. 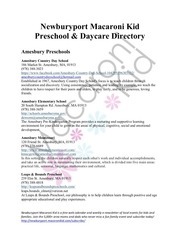 offer a full preschool curriculum. learning through academically strong experiential programming. structured, language-based classroom with therapies interwoven into the curriculum. success each day&quot; in a nurturing learning environment. child can have fun learning and exploring. and we encourage strong friendships and a life-long love of learning. which children can learn to communicate, cooperate and care about each other. children and allows them to learn at their own pace. centers on educating children in a fun, caring and loving environment. This file has been shared by a user of PDF Archive. Document ID: 00709138.